The Willie Mullins-trained seven-year-old, ridden by Davy Russell, outstayed Peter Casey's stable star, who seemingly failed to last out the three miles despite being held up for most of the journey. Quel Esprit set the pace in a four-horse affair, but the race developed into a duel between the big two over the last two fences. Andrew Lynch hung on to Flemenstar until after the last, but he could not quicken to go past Sir Des Champs (11-8), who prevailed by a length and three-quarters. Sir Des Champs is two from two at the Cheltenham Festival and was cut to 9-2 second-favourite with Stan James to make it a hat-trick in the Gold Cup, for which the Nicky Henderson-trained Bobs Worth is 3-1 favourite. Mullins said: "He jumped well, did it well and it looks like there's more improvement. Every year he improves in the spring. He's been to Cheltenham twice and he loves the place. He loves that hill, so I'm hoping he can show what he did the last two years, that he can keep improving coming into March. "We were hoping he would do that at Christmas (in the Lexus Chase), but his jumping errors left him too far out of the race at the second-last. He got his jumping right today and probably the drier ground helped, plus there were only four runners and the one ahead of him (Quel Esprit) gave him a good lead. 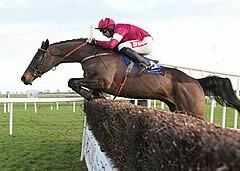 "He got low at the early fences and I thought he would have to improve, which he did. Davy (Russell) was very good on him - he inserted pace four out when he looked around and saw Flemenstar was going so well. He had to do that to make a staying race of it. The further he was going, the better." Of Flemenstar, Francis Casey, assistant to his father, told At The Races: "We were delighted with the way he settled. It could be a blessing in disguise, but I haven't a say (in what race he runs in at Cheltenham). It will be the owner and my father. I imagine he'd be going back in trip, but what race? "I know father was always aiming at the Queen Mother, and I have a slight preference for that myself. Today everything went right except for a few fences. He has a lot of speed and has a high cruising speed and jumping ability. Trying to extend it in longer races, he is not using his jumping ability. "He was just popping his fences and everything was going to plan. We were hoping he'd get there, but it didn't work out. It proved conclusively he is not a three-mile horse. 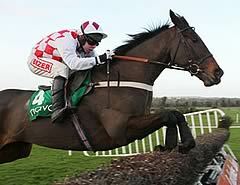 It's an extra two and a half furlongs in the Gold Cup and to me, he'd struggle to get over the last."